It seems like the earthquake and tsunami of March 11, 2011 was a long time ago, and chronologically, I guess it was. 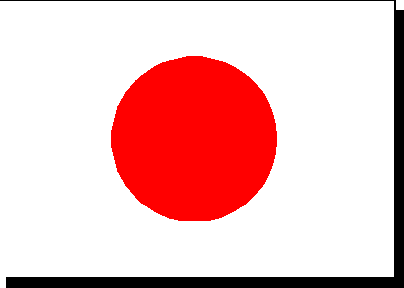 Here in Japan, however, the events of the day are still in the front of our minds, brought to the fore with just the slightest whiff of reminder. Many people across the country are still affected by the events of the day, and many people are still working hard to repair and rebuild those affected areas, as they will be doing for a long time to come, still. One such young woman who is working on rebuilding is Sohpia Slater. I had the privilege of interviewing her recently and she speaks with the wisdom and foresight of someone well beyond her years. Sophia is sixteen and a junior at the American School in Japan. 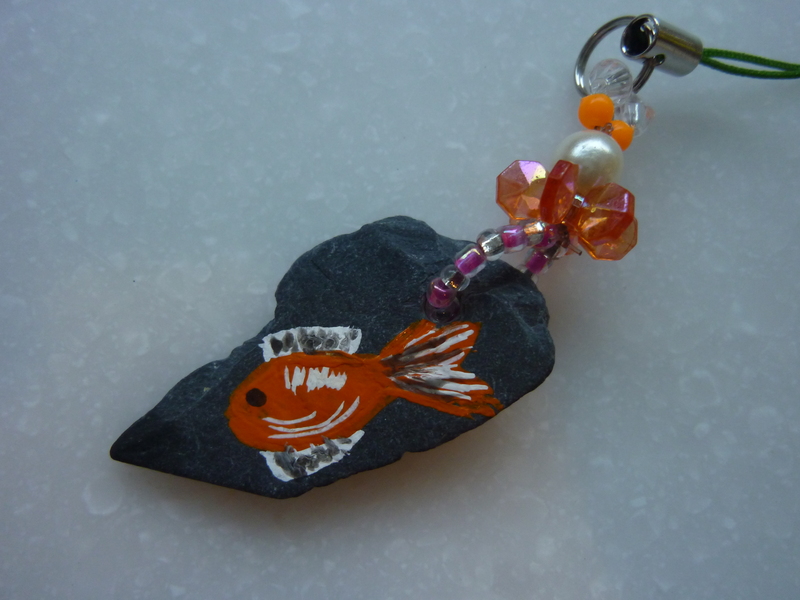 She started the charity “Charmworks” that you can find here. 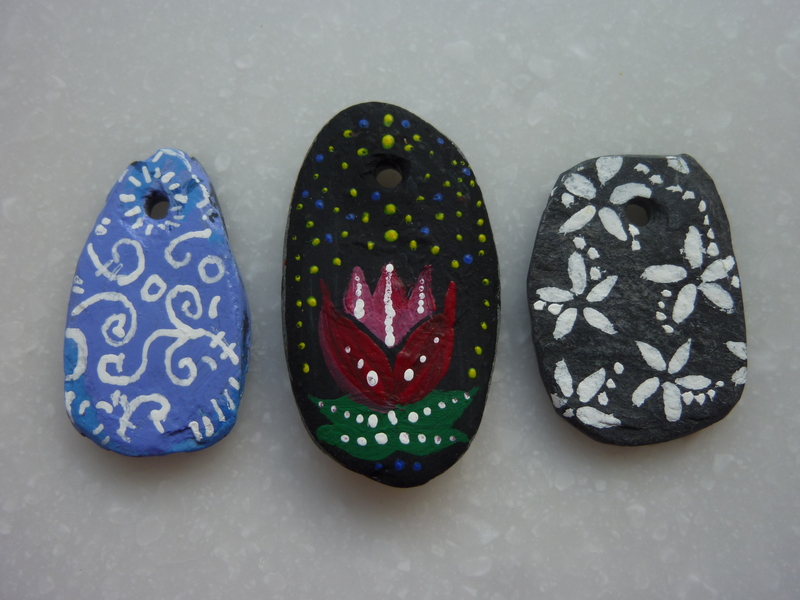 Twice a month, she and various people around Tokyo get together to paint charms made from the roof tiles salvaged from a fishing village in the Tohoku region called Funakoshi. You can read more about my talk with the delightful Ms. Slater on the site A Hopeful Sign. All money she receives from the sale of the charms goes back to the people of Funakoshi so they can rebuild their industry and lives. As a note, in addition to starting Charmworks and being a good student, Ms. Slater is a rather insightful young lady. She has a lot of good ideas about the notion of recovery as it encompasses both physical and emotional healing, and how the two go hand in hand. You can read more about that in her blog posting in the Huffington Post. The young Ms. Slater’s work is one example of the dedicated men and women across Japan who are working to rebuild the once beautiful seaside towns in the Tohoku region. Please consider buying a charm from her, or continuing to support Japan in some way. We live in a 24-hour news cycle these days, and one crisis tends to give way to the next. But people continue to suffer long after the reporters are gone and the initial sensation is over. We should always remember. 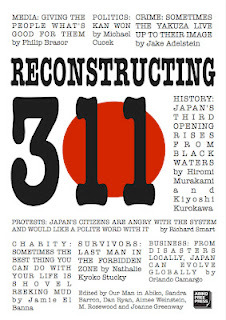 My friend has this theory that all expats in Tokyo who were here for the events of March 11, 2011, have some sort of latent Post-traumatic-stress-disorder. At first I pooh-poohed her idea, but as time as marched on toward the end of the school year for expat kids, I’m embracing it more and more. Perhaps I say this every year, but this year seems particularly difficult as far as the number of families that are planning to leave at the end of the school year in June. In the past two weeks, I have been to a million lunches where it becomes a “last time” sort of sayonara visit together, and I have a lot more to go in the next four weeks until we go. I’m sure there are official numbers of the shrinkage of the expat community – and I’ve heard numbers up to 20% – but I see anecdotal evidence of it every day. This is the first full year after the earthquake, and there’s still seismic activity in the expat community, brought on by the economic situation that was exacerbated by the events of 3/11. Of course then there’s the third group, who says they have no idea when they’re leaving here, but it could be any day or it could be never. These are the people who are scared. They live in limbo and they’re watching their friends be decisive and leaving. It’s a tough space in which to exist, and I fall into this camp. My husband’s job is great and the kids’ schools are fantastic. My husband works long hours, and weekends, but that would be happening wherever we are in the world – he’s an attorney. It’s expensive here, I have no idea how long we’ll stay, and some of my closest friends are leaving. I can’t help but sit here and wonder: do they know something I don’t? I do not want to make it sound like I’m sitting around being upset or anything. I am fine and going about business as usual. I love living in Tokyo as much as I always have and there are no plans for us to go anywhere as of now. I have also spent a fair amount of time connecting with friends who ARE staying, and reminding myself that I will indeed have a lovely life to which to return in August. I am so lucky to know the women that I do, who make my life richer every day. It’s just that August this year will be different. It’s always different, but it will be differently different. Japan and the expat community living in Japan have a lot of work to do to get into the state of New Normal that is coming down the pike. Uncertainty is never attractive. But if we can all keep our spirits up, and be aware of our latent PTSD, I think there can be wonderful opportunities afoot as well. We just have to keep our eyes wide open and jump in with both feet. No amount of whining is going to make it better or different so my plan is to just embrace it as best I can. Your support is appreciated. 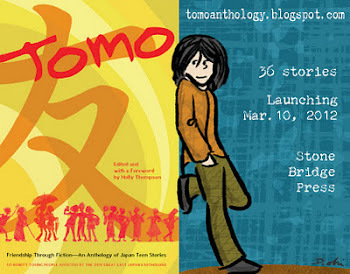 A few weeks ago I had the privilege of attending the launch of a very special and unique book, titled Tomo: An Anthology of Teen Stories. In it, both Western and Japanese writers contribute stories aimed at teens, about some aspect of Japan. Some of the stories are quake-focused, but some are about other experiences of teens – both foreign and Japanese – in Japan and some others are about Japanese teens’ experiences abroad. There is at least one graphic story and more than one prose-poem. 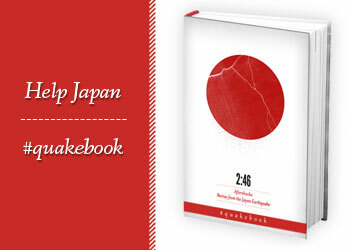 The beauty ofTomo is that all money raised goes to help children in Tohoku affected by the disasters of March 2011. At the launch, several writers got up to read from their pieces, and all of them who read, did so as if they were reading directly to the affected children. They emotion of their words and their voices, to a man, was palpable in the room. It was a wonderful night. The editor of the anthology, writer Holly Thompson, is masterful in her ability to marshal support in the form of creativity, and the authors who wrote for her have produced a prize-worthy collection of pieces designed to explain, inform, and aid teens in their cross-cultural understandings. Please go to the Tomo website here, and see the details of how to purchase this book. I assure you that the teens are not the only ones who will appreciate it. The woman from Ishinomaki, in the Tohoku region of Japan, spoke with passion about the day, just one year ago, that a powerful tsunami, spawned from a powerful earthquake, changed the landscape of her life, both literally and figuratively. Using spare words, she spoke of the rising waters, the running, the devastation and then the despair. Her audience, a group of dedicated men and women who gathered at the British Ambassador’s residence in Tokyo, made no move to check their tears. The event, designed to commemorate the one-year anniversary of the Great Tohoku Earthquake and Tsunami, was also a celebration of life. The people present had donated countless hours of physical labor for clean-up, and money to the British Chamber of Commerce’s (BCC) Back to Business (B2B) program which was started a year ago to fulfill needs of the people affected by the natural disasters. Indeed, the woman from Ishinomaki told of how she learned to have hope again when she met the executive director of the BCC, Lori Henderson, and together they found ways to rebuild the community. Under Ms. Henderson’s guidance, the B2B program has donated practical items such an industrial freezer to a fisherman so his catch can once again be preserved and sent to market, or tractors to help revive the once-thriving strawberry industry of the area. These are necessary items for rebuilding business for people who lost everything, including the tools for their trades. The donations from individuals and companies have been generous and continuous since the disasters. Another visitor from Tohoku who came down from her hometown to participate in the evening said that the generosity of not just the Japanese, but the foreign community, has been breathtaking in its expansiveness. A man who is a principal of a junior high school in the affected areas spoke of the destruction of his home and living in his workplace, which was turned into a shelter. There were pictures of the B2B initiatives including the British Ambassador, Sir David Warren, in his coveralls setting to work. It was an example I will not soon forget. The British people living in Japan, like so many other communities here, came together to help those affected by the Great Tohoku Earthquake and Tsunami, and they understand that just because a year has passed, the need for help is still great. The event I attended raised a further 3.5 million yen for the B2B program. I was so grateful to be a part of the special evening, which of course included wonderful food, wines, and even a song debut by Nick Wood and Julian Lennon, the proceeds from which go directly to charity. But more than what was physically there at the ambassador’s residence, was the feeling present in every attendee: hope. Pride. The promise of the future. The beauty of Japan these days encapsulated in one room – full of non-Japanese people who believe passionately in the possibilities of that future and who actively work to ensure it. This past Sunday, my kids and I went over to the Jewish Community of Japan (JCJ), where we belong and the kids go to Hebrew school, and we participated in the adopt-a-family program from Second Harvest, Japan. It was a wonderful experience in community and helping others for both of my children, and of course for me. Second Harvest is a charity created in 2000 by a collaborative of food banks in Tokyo with a mission to collect food that would essentially go to waste from various venues around the city, and get it to people who would otherwise go hungry. Ergo the name: if the first harvest is the commercial preparation of the food, then this is the second harvest. 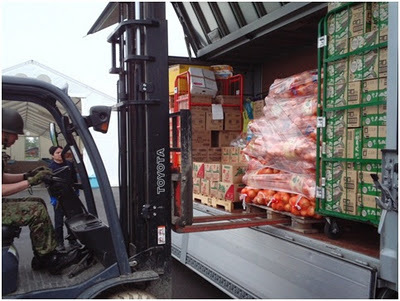 Since the Tohoku earthquake of March 2011, Second Harvest has taken on another role: disaster relief. They have delivered literally tons of food to the disaster-stricken areas in northern Japan. Here is an excerpt from their most recent blog post: After eight months since the disaster, most debris has been cleared, and disaster areas are relatively clean now. More and more stores are reopened, and local people can enjoy shopping. But in areas devastated by the tsunami, local businesses have not recovered yet. Survivors there have difficulties in going for shopping without cars or bicycles. Furthermore, many people have lost their jobs. Food supplies for them are still strongly needed. 2HJ wishes to ask for your unfailing support so we can continue to provide relief supplies for survivors until they rebuild their lives and stand on their feet. The latest project from Second Harvest is to partner with schools and other organizations for an adopt-a-family program. The JCJ asked their membership if they would like to adopt a family and then registered with Second Harvest for those families. In return, the JCJ received specific instructions on how to pack a box of supplies for the families. The boxes had to include staples of Japanese life: rice, dashi-stock, mirin, soy sauce, and seaweed. (Those are clearly not American staples, but they are Japanese staples) The JCJ members were told exactly how many people they were feeding and their approximate ages so we could include small presents if we had space and weight. It was crucial that no box be over twenty kilograms. The family for whom my kids and I packed the box was just three adults. I went to a shop and bought hats and neck-warmers for all three of them – choosing items that were useful, but adding little weight or space. It took us just minutes to put all of the items we bought into the box, label it with the correct number to reach the right family, and then tape it up for delivery. My daughter and son wrote a note to enclose. The kids didn’t talk while they packed, but we had talked plenty about the people less fortunate than we were with the earthquake and subsequent tsunami. Our talk featured a large dose of gratitude, to which the children were particularly receptive. The high school where I teach is doing the same program and will be packing boxes for Second Harvest next week. And so the lessons will continue. There was such a joyous, yet somber feeling at the JCJ as all the children packed. In all, there were 35 boxes done that day. The kids all feel the value of giving to others – and doing it for people in the country in which they live, especially for those who did not fare as well as they did on that fateful day last March. A special thank-you to Second Harvest and to the JCJ for making it happen. Please see the Second Harvest website for information on how to donate to this wonderful cause. Help is still needed and gratefully accepted.